LOCATION: Full sun or morning sun with afternoon shade. PLANTING: Plant in spring after all danger of frost by seed or transplants. Grows well from seeds planted when soil and air temperatures are warm. Root stem cuttings in water or potting soil. BLOOM/FRUIT: Small white or purple flowers in summer. Best to keep them cut off but they are edible and good in teas. GROWTH HABITS/CULTURE: Basil has square stems, soft leaves, is easy to grow, and reseeds easily. 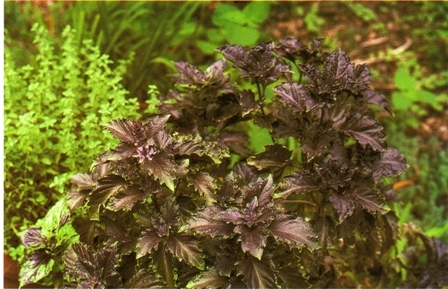 The leaves range in color from dark purple to pale green, serrated or smooth, glossy or crinkly. It is highly aromatic, the flowers range in color from white to purple. Add unfinished compost as a mulch mid summer to keep purple color. Garrett Juice foliar spray will also help. Pinch out flowers and growing tips to encourage bushy shape. Put flowers in potpourri or use for teas. Dark opal basil is used in cooking; has heavy perfume; useful in potpourri; to 18 inches. Holy basil is good in potpourris. PROBLEMS: Worms cause some damage - treat with bacillus thuringiensis as a last resort. The fire ant control formula or garlic-pepper tea is usually all that’s needed. It freezes easily. HARVEST/STORAGE: Make sure leaves are thoroughly dried before storage or use. If you must wash the basil leaves before mixing in oil, be sure they are completely dry (blot with paper towels). Moisture promotes the growth of molds, encouraging early spoilage. Basil freezes beautifully and keeps its lovely green color too. CULINARY USES: Salads, vegetables, vinegars, oils, butter for seasoning and fragrance. Probably the most popular culinary herb. 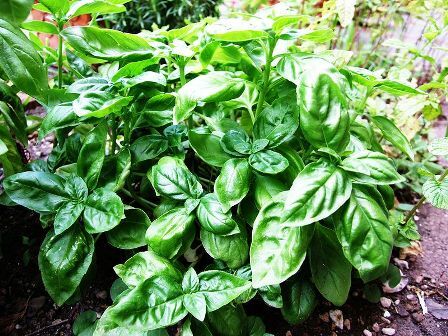 MEDICINAL USES: Basil is generally used for stomach ailments. It is good for gas and digestive problems. It has been used as vermifuge, and to treat ringworm, insect bites and acne. It is a sedative and antibacterial. Use in teas, and eat fresh. OTHER USES: Good to grow in containers. It has been used as a mosquito repellent. basil becomes carcinogenic quickly due to high amounts of volatile oils. Use within 6 months or freeze fresh leaves. The proper pronunciation rhymes with dazzle.